I am a person who does not like crowds, so you would think that attending the Feast Day celebrations of Our Lady of Guadalupe in Mexico City on December 12 would be something I would avoid at all costs. After all, well over one million (some estimates say 5 million) people pack the shrine on the Feast Day. And yet I have always relished the times that I have been blessed to attend. Join me as I reminisce about my first visit to the Shrine of Our Lady of Guadalupe in Mexico City. On the evening prior to the Feast Day, those of us in our tour group who were more adventuresome decided to taxi to the Basilica. Traditionally many famous Mexican singers, performers and high ranking politicians show up for the festivities that start around 10:00 p.m. This lovely tribute goes on deep into the night and the love songs (“Las Mananitas”) sung to Our Lady and the devotion the locals show for her is unlike anything I’ve ever experienced. These are memories I’ll hold deep in my heart forever. On the Feast Day itself (December 12th) we excitedly boarded our tour bus to take us to the Basilica. But what a surprise was waiting for us! Buses were restricted from getting too close to the shrine and we had to be dropped off quite a few blocks from there. At this point we walked the rest of the way….something that turned out to be a blessing. As usual, God’s plans are better than ours. The Feast Day is a family event..here a man brings his young child to the Basilica. As we walked along with throngs of others all headed in the same direction, we experienced a real feeling of pilgrimage; unity with our fellow Catholics. Those alongside us were mostly Mexican pilgrims, both individuals and whole families, carrying placards of the image of Our Lady of Guadalupe. Many had walked for miles, and sometimes for days, to get here. We passed young people rousing themselves from sleep as they had camped out overnight. These heartwarming images help you to appreciate how universal and vibrant our Catholic Faith is. There is more to the Shrine than just the Basilica that contains the miraculous Tilma of Juan Diego, although that is certainly the high point. I think many of us were surprised that the grounds encompass both the new and old Basilica (now leaning as if it will fall any moment). You can also see the room where Saint Juan Diego lived out the rest of his life after the apparitions and his simple grave. Upon entering the grounds where the Basilica is located, we were presented with a kaleidoscope of sights. We were greeted by descendants of those original Aztecs dancing in the ancient dress as would have been worn at the pagan festivals prior to the apparitions to Juan Diego. The dancers reverently process in to the Basilica symbolizing the shift from the old pagan religion to the new religion of Christianity that they now so enthusiastically embrace. The colorful dancers add a festive atmosphere to the Celebration of the feast day. But what moved me the most was that in the midst of it all was the Monastery built atop the Hill of Tepeyac. This is where Juan Diego first encountered Our Lady! The climb is steep, but unlike the time of the apparitions, there are now stairs to make the climb relatively easy (remember you are at a high altitude, so go easy if you have breathing problems). Even the youngest get to join in the dances. It might seem more like a carnival than a religious event….. because the Mexican people do not pigeon-hole their faith in to just one hour on Sundays. It is a part of their daily life. One of the native dancers outside the Basilica. Faith, culture and daily life all come together in this magical land, and nowhere is that more evident than here on December 12th each year. If you can’t make it to the Shrine on that date, try to find some of the many festivals nearby celebrating this Patroness of the Americas. Or maybe you can catch some of the action on one of the Spanish-language TV networks (don’t even need to speak Spanish to enjoy the celebration) or perhaps one of the Catholic TV networks such as EWTN. Facing a long airport layover? Ever wondered how to access the VIP lounges? Interest in using an airport lounge? Most of us have been there: whiling away the hours in an airport while waiting for your flight to be called, sitting in those uncomfortable seats, watching endless news on the overhead TV screens……..while a few lucky ones are in one of the VIP lounges that offer plush seating, coffee, wine, food….even showers in some cases. So how can you take advantage of that? Well, obviously if you have a first class (and sometimes business class) ticket, it comes along with the extra cost. For the rest of us, there are a couple of options. 1. In many cases you can purchase a short time pass directly at the airline’s lounge. It depends upon the airline, and its policy of course, and there is no guarantee that you can get it that particular day and time. 2. Some airlines offer access for an annual fee. If you fly regularly, it may be worth looking into a membership with a particular airline. Usually for a fixed annual fee, you will receive a certain amount of passes per year. After you’ve used the passes, you can purchase more, or often receive a discount on booking future visits. Some of the high-end VIP airport lounges may only be accessible to premium class passengers, some still are available for cash access. And, you are usually limited to that airline’s club….not any others. 3. Some credit cards have arranged for you to pay with miles to access their clubs…..but it is an expensive way to use those hard-earned miles. 4. You can try our newest advertiser, Lounge Buddy. They have an app that is easy to use without an annual fee, the costs to access are often lower, and there’s usually a wider choice of lounges available to the ‘casual’ flyer. Lounge Buddy works by providing details of every available lounge in an airport, and how to access them. Lounge Buddy offers genuine reviews by real customers, details of all facilities, and photographs. For example, if you need fast wi-fi, find which VIP airport lounge offers the best by browsing them on Lounge Buddy. Likewise, if you’re interested in a drink and some snacks, but don’t want to pay the high price of the airport concessions, use Lounge Buddy to discover which lounges offer complimentary drinks and snacks. Find out more about Lounge Buddy here. They also offer reviews of hundreds of lounges around the world…(not all of them are worth the money), where they are located in the airport, and what services are offered. If you purchase via them, The Catholic travel guide may earn a commission – although the cost to you WILL NOT increase. But commissions like this help support our website. 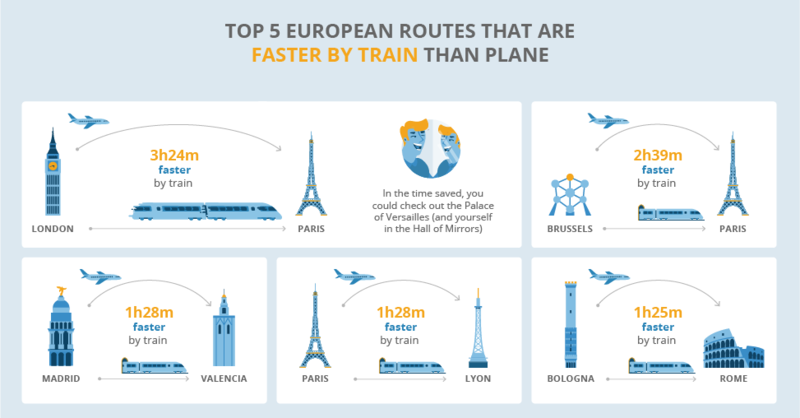 We often think of flying being a faster way to travel from city to city in Europe, but often that is not the case. When you consider time spent in the long check-in lines at the airport (along with having to be there about two hours early) versus most trains requiring you to be there only 30 minutes prior to departure, there is a great time savings there. Then there is the fact that most train stations are in the heart of the city, while most airports are a bus or cab drive away, train travel comes out not only faster but also cheaper than plane travel. Infographic courtesy GoEuro….your source for train and bus tickets in Europe. As of October 1, they have ceased operations. Primera air offered discount airfares from Stanstead, England to several cities including New York (Newark’s Liberty Airport), Boston, Washington DC and Toronto starting at a little under $200 each way. Those already in their booked locations will have to arrange their own transportation back home. The discount airline offered fares under $200 for Newark to U.K. flights but was unable to compete with several other discount carriers. Those who purchased using credit cards should contact their credit card issuers for possible refunds. If you purchased travel insurance (we always recommend that you do)……you may be able to get a refund from the issuer. Squaremouth is what we recommend to compare policies. My name is Mignon Toppino. I am a Junior studying Religious Studies and Social Justice at Cabrini University. This past June I was blessed with the opportunity to go on an eleven-day Italy Pilgrimage with Select International Tours. The experiences I had on this pilgrimage opened my heart up to greater growth and learning of who I am and who my heavenly Father is. Before attending Cabrini University in Radnor, PA, I attended Cabrini High School in New Orleans, LA. So, I grew up learning from and about Mother Cabrini. Going to Mother Cabrini’s birthplace was truly the highlight of the trip for me. Being able to be in the presence of the relic of Mother Cabrini’s heart was such an awakening moment. It’s quite difficult for me to really form the right words that describe the amount of joy, peace, love, and beauty I felt in those moments. I do know I have never felt surer of God’s love and mercy. To explain to you fully what this whole experience meant to me and what I learned from it, I must explain what season of life I was in before the trip. I was having a great struggle with loving myself, seeing the face of Christ in myself, and hearing and understanding God’s voice. To say that this trip was simply a great trip with beautiful opportunities would not be completely honest, because for me this trip was transformative. Everyday since the trip, I have learned a little more, I have started to love myself a little bit more, and by God’s grace this beauty will not stop. This trip was so transformative for me because it taught me the power of intentionality. years. I can tell you for a fact that without Mother Cabrini’s life of love, faith, and bravery, my life would not be what it is today. (Church of the Most Holy Redeemer and St Frances Cabrini). The skull of St Frances Xavier Cabrini rests within this church. It is placed within a wax figure of her likeness as shown here. The above article was re-posted with permission from Select International Tours. Travel Insurance during hurricane season….is it too late? The Atlantic hurricane season is active this year, and for those traveling (especially on cruises) you need to be aware of what coverage you may have on travel insurance. Most beaches and tourist attractions begin to close a few days before forecast landfall if it is going to be a category 3 (sustained winds of 111-129 mph). The highest is category 5 with sustained winds over 136 miles per hour. The danger is not just the wind but also the torrential rainfall that accompanies hurricanes (especially if it is slow-moving). And, of course, if you are booked on a cruise the itinerary could likely be changed, but that should be covered by the cruise lines. However, if the cruise does go ahead (perhaps with some port substitutions) and you simply cannot get to the point of departure due to the hurricane, then you will wish that you had taken out travel insurance, because the cruise line will almost certainly not refund your money. Many travel insurance policies include coverage for hurricanes that impact travel, as long as the policy was purchased before the storm was named. Travelers who had a policy in place prior to the naming of the storm including Trip Cancellation and Travel Delay, may be protected in event of cancellation. If it was purchased after that point, it won’t cover hurricane-related travel changes, said Steven Benna, a marketing specialist with travel insurance comparison website Squaremouth. The Hurricane Lane Travel Insurance Information Center explains coverage related to the storm. This database is regularly updated by Squaremouth’s travel insurance experts with answers frequently asked questions, official provider position statements, travel alerts and notices, and other information as the storm develops. Information is subject to change at any time. Many airlines will offer to waive change fees, etc. so if you have booked air it is best to check with the airline. We often go out of the US on Catholic Pilgrimages, but do we know about the amazing Catholic history of the US itself? In Santa Fe, New Mexico, Mass was being celebrated 14 years before the pilgrims landed on Plymouth Rock, and you can visit the oldest church in continuous use in the US to see where that happened, and where the first martyrs in the US died for their Catholic Faith. Santa Fe and the surrounding area is home to amazing sites of Catholic spirituality. A bit further North, the Santuario de Chimayo is termed “The Lourdes of the United States,” where Christ is known to bring about miraculous healings and where devout pilgrims, descendants of the first Spanish settlers in the 1600’s, still walk on foot to visit from around the state every year. Do you know the Story of St. Joseph’s Staircase–a miraculous architectural feature in the Chapel of the Sisters of Loretto that pious tradition tells us was built by St. Joseph himself? Science backs up the tradition, as a NASA study on the wood of the staircase stated that its molecular structure was not of a plant that could have grown on our planet. It is something you need to witness with your own eyes. These are just a tiny few of the amazing experiences Santa Fe holds for devout Catholics. We would like to invite you to visit and to stay at a beautiful historic downtown Santa Fe adobe house owned by Familia Victricis, an Association of the Faithful in the Archdiocese. Contact Giovanna at (505) 490-2775 or [email protected]. We would love to share pictures of the house, and special itineraries, guided by local priests, historians, and EWTN personality AnnaMaria Cardinalli are available. Most of us know of Saint Dominic de Guzman, founder of the Dominican Order. We celebrate his feast day on August 8. But there is another Saint Dominic from whom he got his name. That saint’s name is Saint Dominic of Silos. He lived in the 11th Century and became known for his gifts of healing, among other things. People came from far and wide to beg his intercession. Tradition tells us of a woman who had a dream before her son’s conception in which she saw a hound racing through the world igniting everything with a flaming torch. Troubled by this dream, she went to pray at the Benedictine abbey of San Domingo de Silos where Saint Dominic of Silos was buried. When her son was born, the parents named him Dominic, and he grew up to become Saint Dominic de Guzman, who founded the Dominican Order. You can find his tomb in the Basilica of Our Lady Help of Christians in Bologna. This dream was indeed prophetic. Dominic did ignite the world with sacred truth through his preaching. Saint Dominic de Silos is buried in the Abbey that he helped re-build: the famous monastery at Santo Domingo de Silos. You have no doubt heard the hauntingly beautiful CD of the monks performing the Benedictine Chant….they are from this monastery! Let’s pray for the intercession of these two great saints. From the evening of August 1st until sundown on August 2nd each year, you may take part in the Great Pardon of Assisi. When Jesus and the Virgin Mary appeared to Saint Francis in the year 1216 in the tiny Portuincula (the chapel he built) Jesus asked Francis what he wanted for the salvation of souls. Francis humbly replied that he would like to obtain an indulgence for all those who entered the church, who were truly contrite and had confessed their sins. Jesus granted him this wish but stipulated he should first present his request to the Pope. He obtained approval from Pope Honorius III and this came to be known as the Portuincula Indulgence, or the Pardon of Assisi. If you happen to be in Assisi today and tomorrow it is a great opportunity; however, you can earn this pardon for yourself or for any departed soul at your local Parish church. 1. Sacramental Confession within 8 days either before or after. 2. Participation in Holy Mass and Eucharist. 3. Recitation of the Apostles Creed, Our Father, and a prayer for the Holy Father’s intention. The Portuincula is now inside the Basilica of Saint Mary of the Angels at the foot of the town of Assisi. Almost all tours stop here either on the way to Assisi or upon leaving. The Basilica is immense and the Portuincula is dwarfed by its surroundings. As you can see here, it is quite small but open to visitors.